During the years of 1896 to 1986, John Theodore Rademaker was providing cold beverages to Grant County. This business was significant during the time periods of the U.S. and the rest of the world. It also impacted Grant County in several ways. The Coca-Cola plant was significant during its generation and continued to ours. The Coca-Cola plant was an influential business then and always will be. The plant was started by John Theodore Rademaker back in 1898. He first called the business called the business just Rademaker, and the later changed it to Rademaker & Son, the later it became to be Rademaker Brothers. In 1919, the company became a Coke franchise. J.T. Rademaker went down to Tennessee multiple times to get a franchise in Grant County. He succeeded by doing so by meeting with the owner’s of the Thomas Company. Unlike the other franchises, the distribution area for the plant in Marion was very minimal. Well, in 1935 J.T. died and never got to see the company he started prosper. So the company was passed down to his two sons. 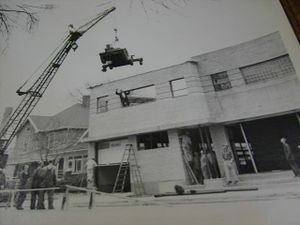 So in 1937, they took the plant from the alley of Washington Street, behind present day Malone’s, and moved it onto South Branson St. This became the first expansion of a company that would continue to grow. The company was moved off of Branson St. to 17th and Washington, where it would continue to grow. 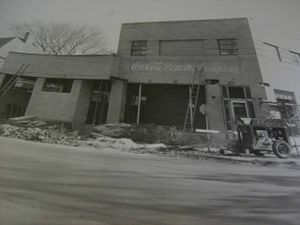 While continuing to grow as a company, the building was added on from its little area to one with more room. These add on allowed the business to hire more people and produce more coke products. During this first expansion, the plant was broken into and the safe was blown up. So while the company is continuing to grow, the plant was expanded for the third and final time. This time they added on a dock that allowed the trucks to get into the plant and have the coke loaded straight onto the truck. They called this add on a “drive thru,” because it allowed the truck to drive straight through the plant and get loaded and be on its way. After this expansion, the company was broken into once again. Again the safe was blown up for the second time. The Coca-Cola plant had a considerable impact on Grant County and the surrounding areas. One reason was by providing cold beverages to the city at a low cost. 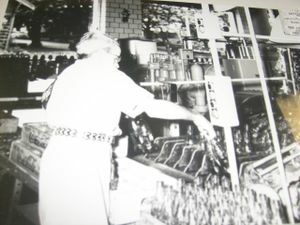 Rademaker also bought all of their products from local businesses and factories not only supporting themselves but other struggling businesses in the area. For example, they bought glass from Owen’s Glass in Grant County. With many unfortunate people in Grant County, the plant provided jobs for the minorities, hearing impaired, mute, and poor class citizens. During all the years of business, thousands of people were employed and supported through the company. Even though it was not a large plant, it was still able to provide a scholarship for a student at Mississinewa High School through the Community Foundation once a year. Like many other local businesses, it also sponsored a baseball team at The Marion Pal Club and Lincoln Field. Unlike other factories, Rademaker’s offered educational tours to all elementary, middle school, and high schools in Grant County. Along with all the other companies in Grant County at the time, the factory provided extremely competitive wages and benefits. Some of these benefits included being a part of the Union, a provided health insurance, and a pension program as well. These programs helped many people once they went into retirement with their finances. While offering many benefits, the company provided jobs year round, even though coke was only a summer demand for quite a long time. This helped many of the less fortunate people to get jobs and make money. With the growing poverty of Grant County, a plant provided much economic assistance during its time. The Coca-Cola plant was a prominent business at that time and always will be of that time. This business was noteworthy during the time periods of the U.S. and the rest of the world. It also impacted Grant County in several ways. 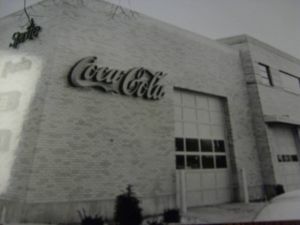 The Coca-Cola plant was significant during its generation and continued to ours. 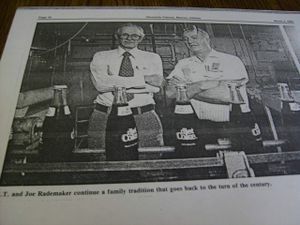 Rademaker family’s business added much economic range from 1896 to 1986. This page was last modified on 4 June 2007, at 09:43.